As Florida governor Rick Scott’s office last year searched for a justification to bar a Satanic holiday display from the capitol building in Tallahassee for the second year in a row, state lawyers proposed blanket restrictions on expression in public buildings, the Tampa Tribune reported Sunday. Ultimately the rule change conceived by lawyers in the Department of Management Services was not adopted, but evidence of the proposal survived in a draft document circulated among staffers where a clause pertaining to “freedom of expression consistent with the first and fourteenth amendments of the United States Constitution” had been struck through with a black line. The section would have been renamed “peaceable assembly,” but even that was not guaranteed–the lawyers also recommended lengthening the required advance notice time for groups requesting use of a public building from the current 3 days to 30. 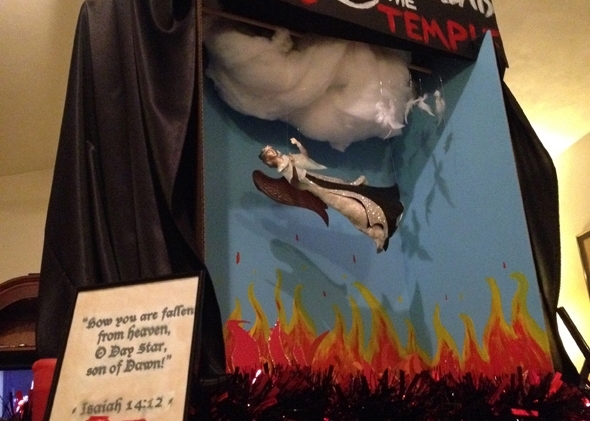 The proposed changes apparently came about in response to the Satanic Temple’s persistent effort to erect a holiday display in the state capitol rotunda alongside those for various mainstream faiths as well as atheism, Festivus, and Pastafariansim. The Temple’s application was rejected in 2013 as “grossly offensive for the holidays,” but the threat of a lawsuit from Americans United for Separation of Church and State apparently persuaded officials to reconsider in 2014. The display was finally allowed, although the Tribune reports it was damaged when a private citizen attempted to remove it from the building herself. Neither Scott’s office nor DMS have offered any comment as to why they considered restricting expression in state buildings, nor why they ultimately decided not to implement the proposed changes.